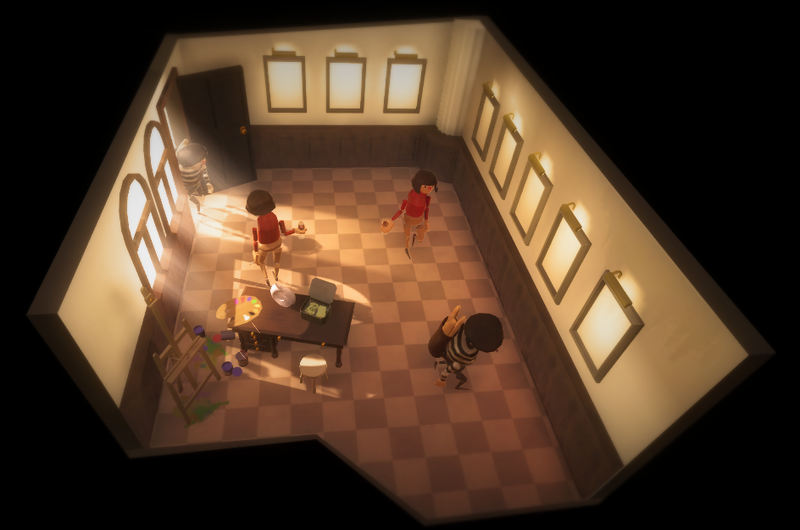 I’ve been spending time creating the feel of the environment for our next prototype. After tons of lighting and post processing and it’s looking cozy as cat in a cardboard box. This week has had me occupied with looming over the Epidemic page on Gamejolt, preparing formal speeches in business english, and making UI things and character animations for Passpartout. 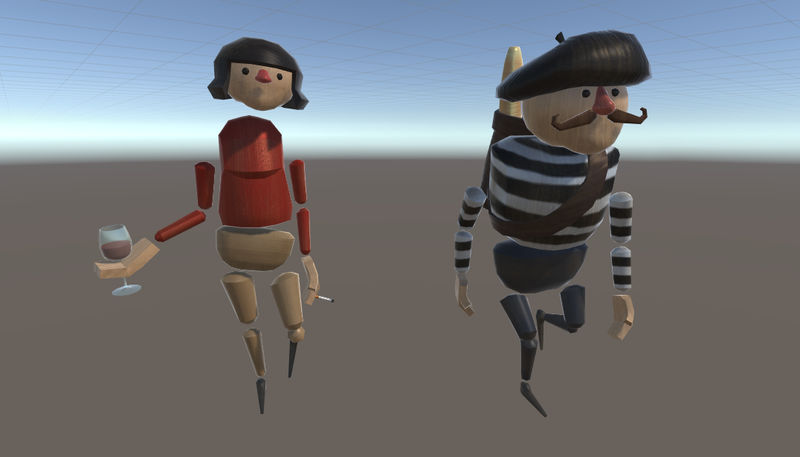 The animation work for this prototype was especially interesting, as we are making stereotypical french characters that resemble wooden marionette puppets. This allowed me to play around a bit with the animation style which was a lot of fun. I worked on the character models and textures this week. We decided to go for a slightly different approach with a marionette doll look in order to save time on the production process. It was also a fun opportunity to work with wood esque texturing. GameTweaker – a window that collects all designy tweaky fields found in the game. We’ve had some frustrations in the past due to the difficulty of finding the gameobjects to tweak and as a result a lot of things were often overlooked. Marking fields with the GameTweakable attribute in code makes it show up in the editor, so very little work is needed for it to function. It’s Currently sorted in shared -> instanced order, but I think I’ll sort it by script type in the future. It haven’t ben put fully into work yet, as other game elements still needs to be added, but I think it looks really promising! Future features would include prefab compatability & array/Collection support. Added customers which will walk along a shared defined route and judge paintings. Will buy a painting if it matches their criteria. 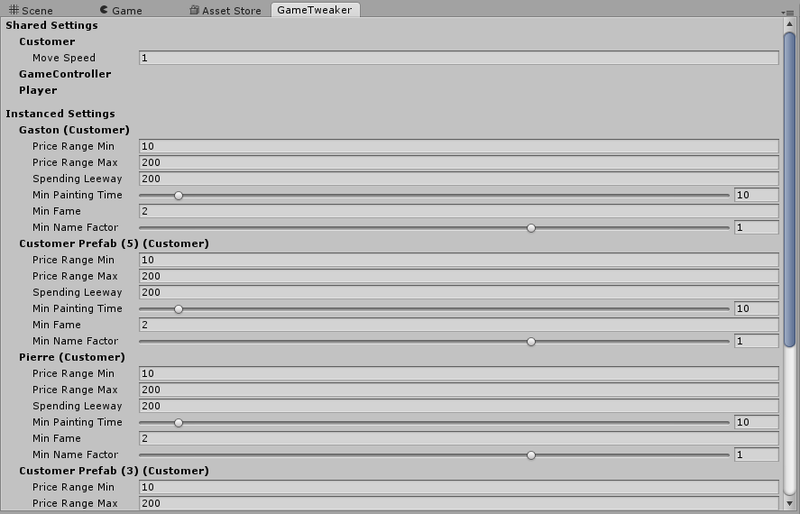 Added timecycle, counts days and sends the tax man (not an actual character) at you at the end of the week. Next week I’ll work on tying up the loose ends and rounding off the project. Writing music for this prototype has been a real challenge. Since the setting is very french, at first I wanted to make the music sound very french. Therefore, as many of you probably would have guessed, my thoughts immediatley went to the music of Yann Tiersen. I started trying to write themes for accordion, melodica, glockenspiel etc., which didn’t work out at all. I didn’t really have time to practice and record a song properly on a real instrument, and my banks for those instruments sounded pretty crappy. In the end I decided to go with a more minimalistic approach, reminiscent of The Sims. The theme only contains four instruments: piano, clarinets, upright bass and drum kit. All the instruments are very minimalistic and repetitive, but in the end I think the finished product turned out just fine. Tell me what you think! Wich software did you use for the characters?? ?